I had a great time with friends Bev and Richard at Dubbo, my brother Lynton boarded with Richard’s family for 2 years about 50 years ago and they became lifelong friends. 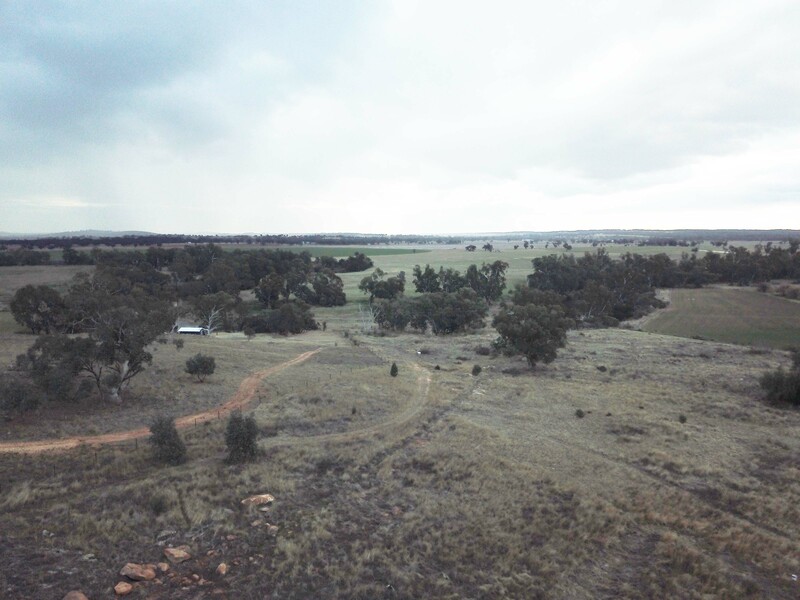 Bev and Richard have sold their sheep property near Walgett, which Marg and I visited in 2011, and built a new house just outside Dubbo. I set the van up on their 10 acre block, which has MacQuarie River frontage. Their hospitality was excellent and I didn’t have to do any cooking for the 3 days I was with them. We did several tours around Dubbo and visited a pig farm run by their daughter Alex and her husband Michael. I tasted their bacon which Bev cooked for breakfast on the last day I was with them. I was so relaxed that the only photos I took were when I was demonstrating the drone to Richard. Unfortunately it was very overcast at the time. 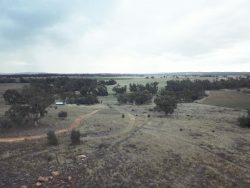 The photo is the view toward Dubbo that they see from their house. 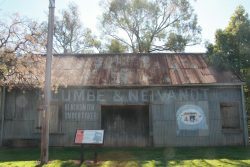 I left Dubbo and travelled through Lake Cargelligo (overnight stop) to Jerilderie where Ned Kelly held up the town in 1879. When he got to town he went to the Post and Telegraph Office and made the postmaster dismantle the Morse key and got townsfolk to cut down 8 telegraph poles. 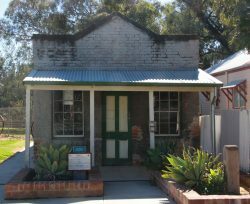 The tiny Post and Telegraph Office building still exists. 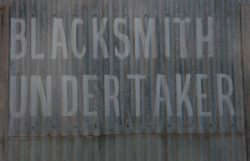 Ned and his gang also had their horses re-shod at the blacksmith’s shop that also still exists. 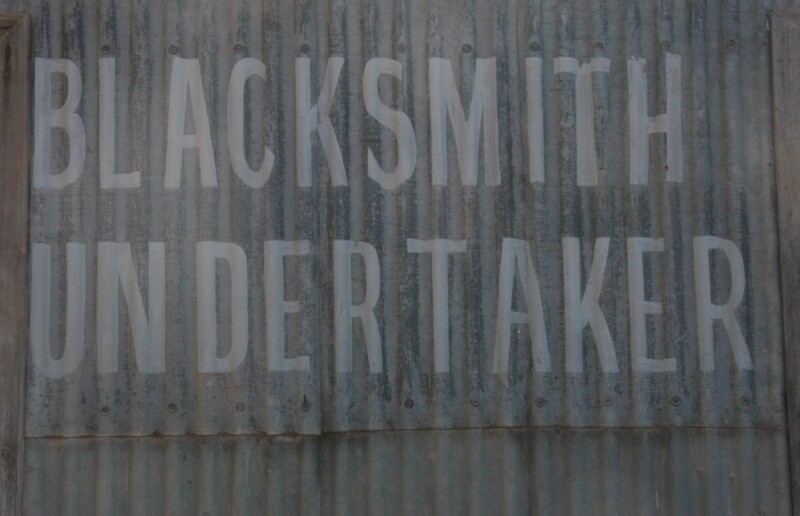 Apparently the blacksmith was also the undertaker as the sign attests, what a strange combination of jobs. 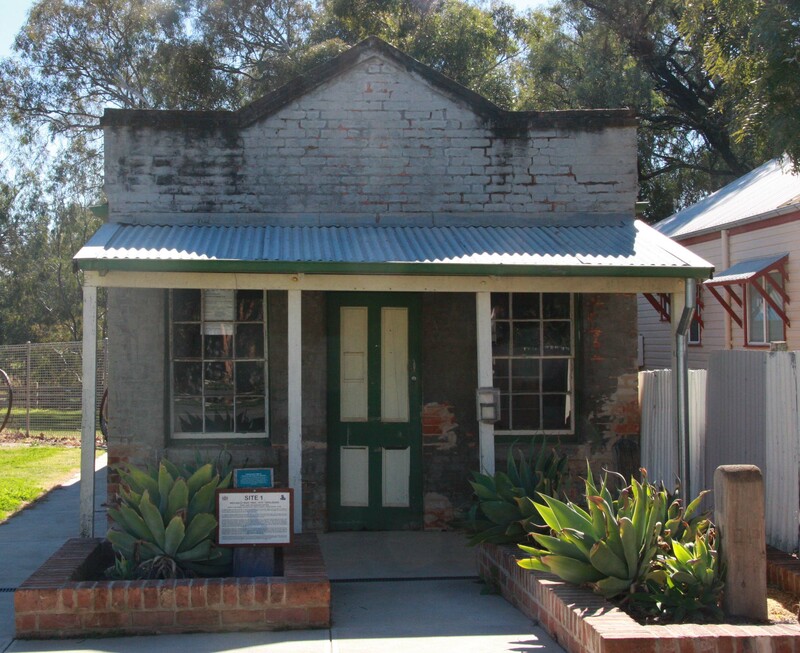 While in Jerilderie, Ned and his gang held hostages in the Royal Mail Hotel, robbed the bank and had all the loan security documents held by the bank burned. Another claim to fame for Jerilderie is that John Monash lived there from 1874 to 1877. 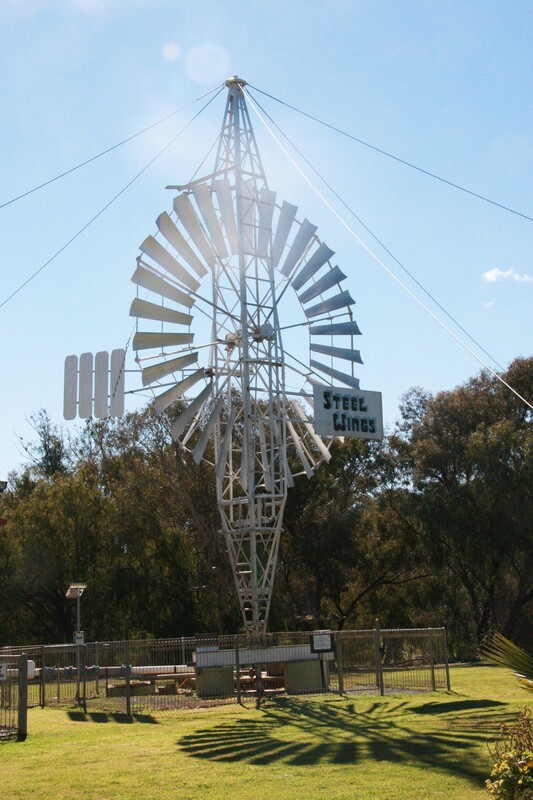 Finally the largest windmill in Australia is installed by the lake at Jerilderie. It is 25 feet in diameter and is in working order able to pump 25 litres of water on each revolution of the sails. It was great to catch up with Deen camping on the Murray River after I left Jerilderie. 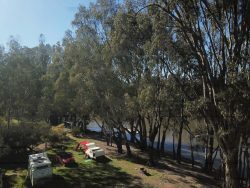 We camped at Morning Glory Resort, a caravan park on the banks of the Murray. It was good to sit around a campfire for a few nights and enjoy lots of good chats. As usual Deen’s camper attracted interest in the camping area. We drove around to Cape Horn Winery through a redgum forest for a wood fired pizza and wine tasting, the winery is part owned by the people who run Morning Glory. We also drove to Echuca-Moama to get Deen’s gas bottle filled, we visited about 8 places who swapped bottles, but none filled them (Deen’s gas bottle is a special size). We eventually got the bottle filled at a caravan repairers, who also did it for free, as he wasn’t sure how full it was. Our other trip to Echuca-Moama was equally frustrating, we were going to Oscar W’s restaurant on the Murray for lunch, but it had closed permanently, and then we went to two wineries, one was unstaffed and the other turned out to be a cafe. We did eventually enjoy excellent fish and chips at a pub on the wharf at Echuca. We took a back road on return to camp, which was good, but involved a number of detours off the road through the forest to avoid flooded sections of the dirt road. There’s been plenty of rain in the Murray valley then? Great drone shot of your and Nadine’s campers. Dad was very fond of Richard and Bev. I had some contact with Richard when Dad dies 5 years ago. I’m glad you enjoyed your visit to their place. There has been lots of rain in Victoria but that has been missing the west of NSW where I travelled. Even now when Victoria is freezing and wet, western NSW is still dry. Your Dad kept in regular touch with Bev and Richard, I think the Meyers were like a second family when he boarded there. Richard enjoys conversation so we had a number of good chats in the time I was there. They were interested to know how all the UK Incolls were all going. ???? I tried to paste an emoji but it didn’t work, hope this one does. Oops! Emojis turned into question marks for some reason? (????????). Welcome back mate. Thanks for all your sharing. Marg would be very impressed. ??? ?